Thanks for sending me this blog subject. I hate to say this, but I must be one of those mothers! All those tools, and then some are very familiar to me! 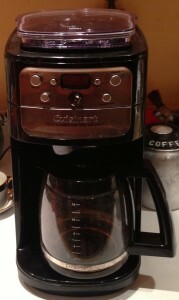 In fact, my coffee maker looks a lot like the one you have pictured! I think it’s called the Kitchen Designer’s kitchen, instead of the shoemakers children! I actually love the old tools and have quite a collection gleaned from my mother’s and my aunt’s kitchens. 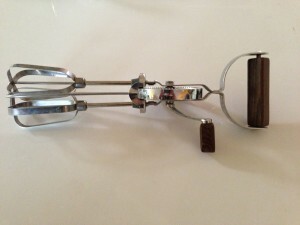 I just used my mom’s wooden handled potato masher a couple of days ago! By the way, you are much more conscientious than I about your blog than I. I admire that! 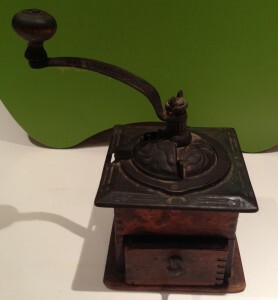 Mine was a cast iron sausage grinder from my grandmother. I also inherited her spaghetti bowls and other ghostly implements. Somehow I find them grounding, despite not utilizing all of them. They remind me of a simpler, nourishing time. I’m no pollyanna–life was in many ways more difficult without so many of our modern homemaking conveniences; however, easy and simple are indeed two very distinct ways of being. Sometimes l long for the simpler time. You’re reminding me. I also inherited a meat grinder, but think it’s made of some composite metal. I think I gave it to Kiva for sausage making. I agree, the older tools are grounding. A simpler time, I think we all want that. I wonder if modern conveniences take us there. I think it’s possible, but we must also absolutely strive for that as a goal, otherwise we get tripped up in all our sometimes very expensive so-called time savers. Thanks for the comment and thoughtful words.